scuffling in the leaves, dodging torrential downpours, lighting candles and enjoying the blackberries round about our way. This season I was also excited to take part in the Relax and Recline campaign by Fenetic Wellbeing, which aims to match every individual with the right furniture pieces for their needs, their snug, sumptuous chairs providing comfort to those who need it most, especially important in the colder months. 1. In collaboration with Fenetic Wellbeing, this dreamy swivel reclining chair has earned a place on my list. It looks so comfy and even comes with a matching footstool, I'm pretty sure this is a cloud disguised as a chair. I love the cream shade and only wish I had invested in a reclining number sooner. All year round extreme fatigue leaves me wanting to hibernate, in Autumn I long to curl up in the cosiest chair possible. 2. White and gold pumpkin, tk maxx - I'm loving all the cute autumn finds in my local TK Maxx and they have such a cute selection online too. Next year I am pledging to save all my pennies for autumn and then splurge on all the pretty Halloween pieces I can find. This white and gold pumpkin is one of my favourites. 3. 'Autumn vegetables' apron, h&m - This apron is so sweet! It's very affordable at £6.99 and I love the Autumn veggies print, perfect for autumn baking. Now we have a garden I am so excited to get a little vegetable garden up and growing and do updates on the blog again. Will I get a Peter rabbit visitor I wonder? 4. Acorn glass vase, h&m - This year I am all about gold accents and love the little acorn stopper on this vase. It's so pretty and would suit cream and pastel shades down to a 't' aka my heavily pastel backdrop. 5. Milk white bunny cushion, h&m - this cushion is almost too sweet to handle. It's my ultimate winter cushion, having both ears and a cute bunny nose. I think I might buy this and wait for it to be adorned with nutella kisses! 6. Witches Coven art, tk maxx - this little Halloween plaque is so cute and exudes vintage, shabby chic vibes. I've been adoring @littletinyghost home decor on Instagram lately and plan on displaying it all year round. 7. Swivel recliner office chair with heat and massage, Fenetic Wellbeing - I think I missed the memo that you can buy chairs that have heat and massage functions, I had no idea they existed. Now that I know, I can't go back. It even reclines and comes with a whole year's warranty. I love the ecru colour, £85 is a steal! 8. Shell pink fluffy bunny cushion, new look - I think I have a thing for cushions with ears. This baby pink number is adorable, it comes filled too which is so handy; it's often tricky to get hold of cushion fillers. 9. Rose gold leaf photo display, new look - Autumn/Fall lovers, this is for you! Such a cute way of adding a little autumn charm to your home while pinning up all your snaps, it even comes with little gold clips. 10. Bunny candle holder, h&m - have you noticed a bunny theme? Adding little emblems of woodland creatures - I haven't yet harnessed the singing power to add the real thing - nuts and fruit is a nice way of bringing nature inside, and instead of decaying or raiding your cupboards they keep still all winter long. 11. Vintage style wooden crate, h&m - this pretty storage box exudes vintage vibes and I love its rustic look, perfect for introducing a sense of warmth to a room. The perfect place to store candles come autumn. 12. Tetbury electric rise and recliner, Fenetic Wellbeing - This has to be the ultimate comfort chair and perfect accessory for a shabby chic, country cottage style living room. It's even on trend, with its own teddy bear style coat, like the gorgeous fleecy numbers in the shops at the moment. Just add bunny cushions and pretty rug. Everything looks so pretty! And the chairs look super comfortable. Cute picks, the blush tone is everything. Now that I'm back in the UK I'm so excited about autumn! 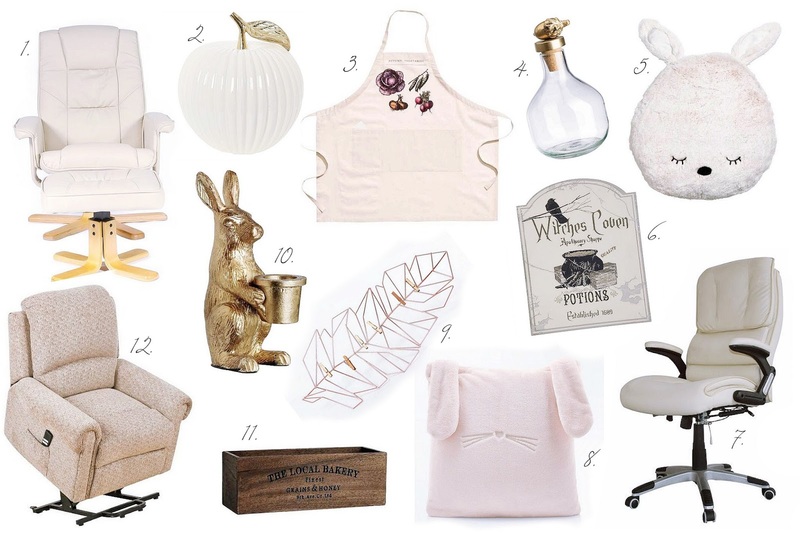 This is an awesome wishlist, so many of these items are super cute :D The bunny cushion is absolutely adorable, it's my favourite thing along with the candle holder! The bunny candle holder is adorable! I love all the cute bunny things, especially the fluffy ones!